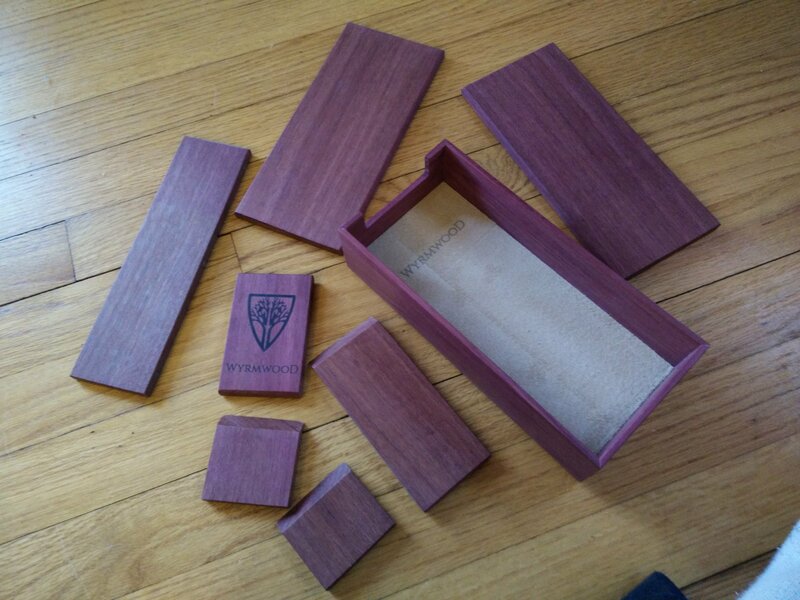 Seen at almost every tabletop booth at PAX East were Wyrmwood Gaming wooden accessories. 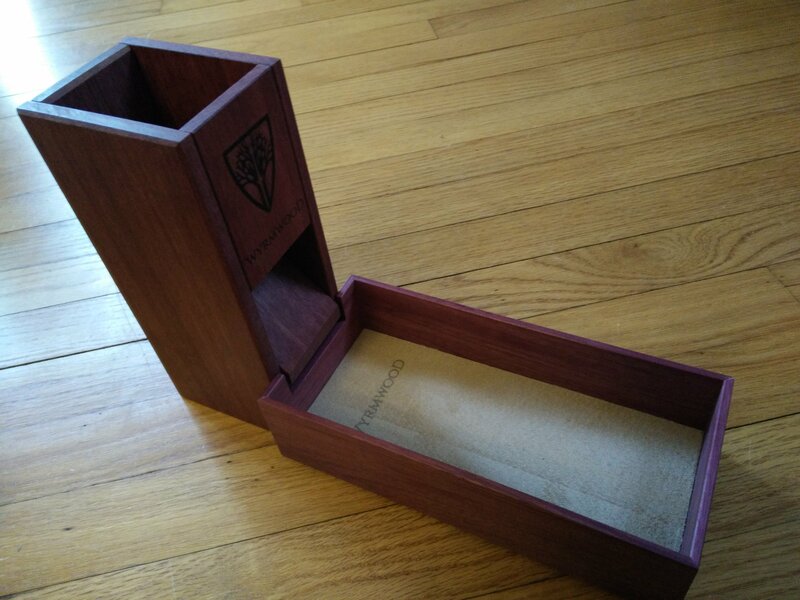 Be it dice trays, towers, vaults, or deck boxes, you couldn’t escape Wyrmwood’s presence. Their actual booth was a marvel with all sorts of beautiful wooden items, including a custom Crokinole board. 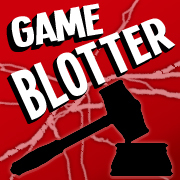 After a few email exchanges I was lucky enough to be the recipient of a dice tower, dice tray, and dice vault to review here. 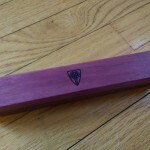 Each of the three pieces was crafted from Purpleheart wood, which I had never really heard about until now. The pictures online looked beautiful, but they’re nothing compared to how the wood looks and feels in person. 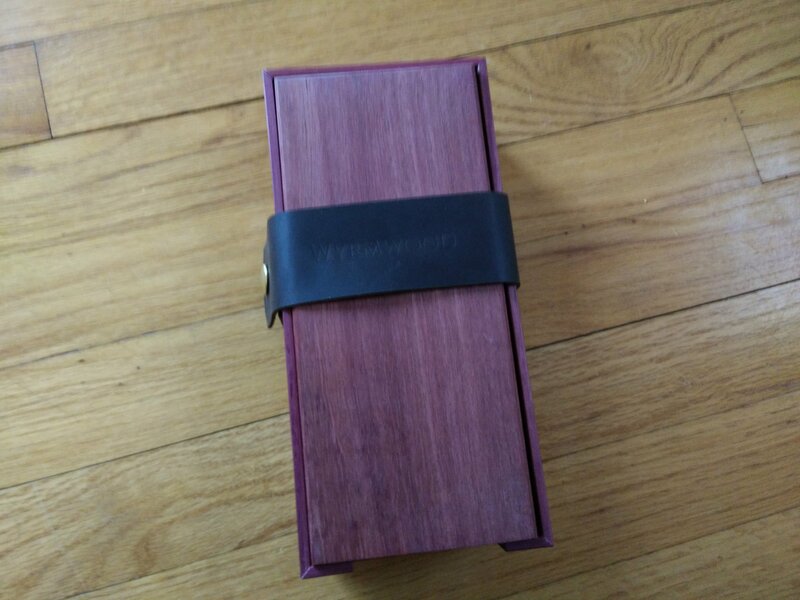 Everything arrived wrapped in brown paper bearing the Wyrmwood logo. 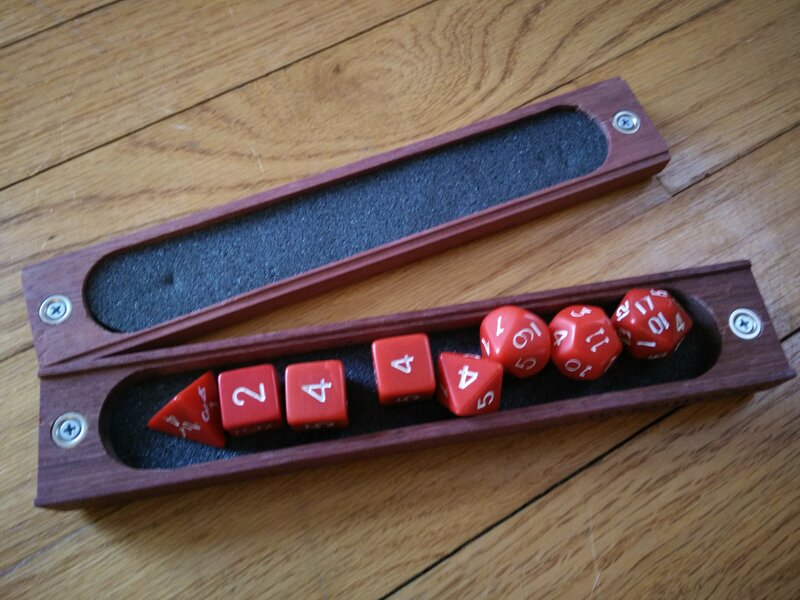 Once upwrapped I found all the pieces neatly tucked into the dice tray and secured with a leather strap. 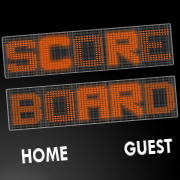 Here’s the really cool part. 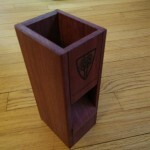 The dice tower is flat-packed and snaps together using magnets. 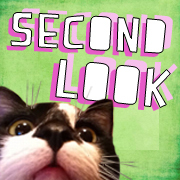 This allows for quick and easy disassembly to store right back in the tray. All the pieces fit in perfectly with room for the dice tray. 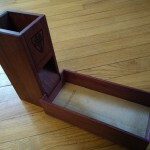 It’s pretty amazing how solid the dice tower is once it’s put together. 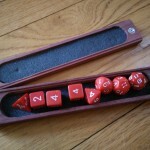 It fits neatly up against the tray so that dice spill from the tower into the leather-line tray with a satisfying sound and tumble. I have to admit I’ve been using the tower for any game we’ve played with dice in it since the set arrived…even if the game only has 1 or 2 dice. 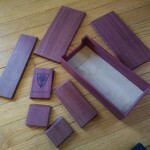 The dice vault they sent is just as durable and well-crafted. 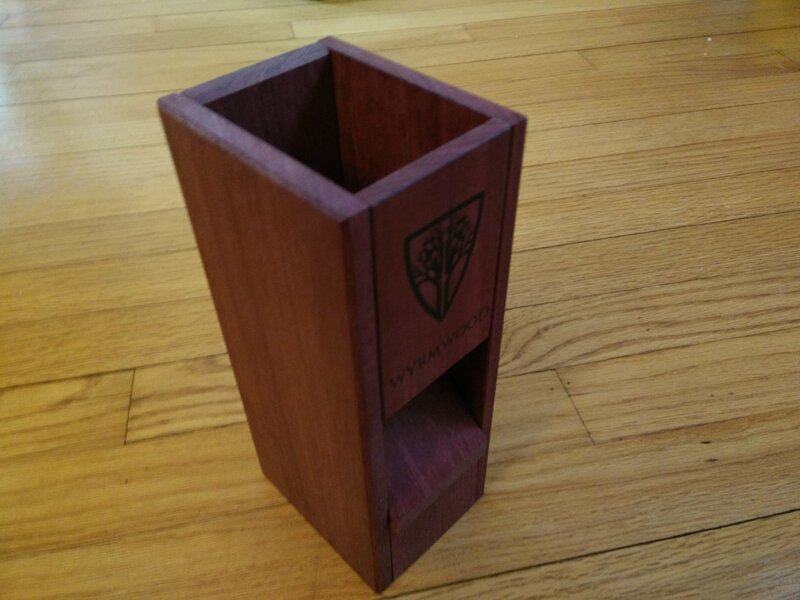 The lid snaps on with magnets, and there’s a stiff foam inside to keep your dice safe. I’ve got my original set of polyhedrals from when I was 8 in there currently. 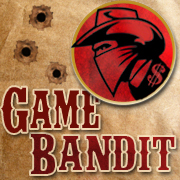 I was told that this guarantee is unconditional, not time-sensitive, and applies to everything they make. 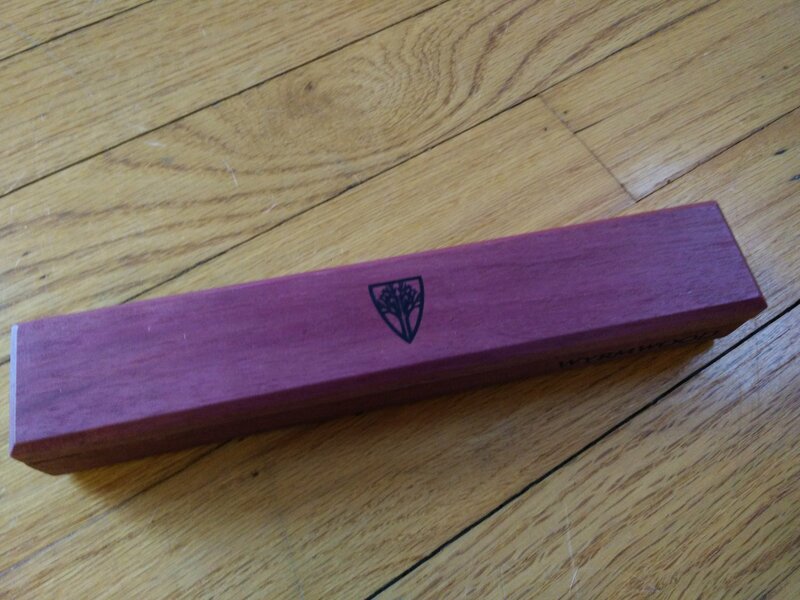 I can’t recommend Wyrmwood’s products highly enough, and with a guarantee like that you can feel safe knowing your investment is well made. 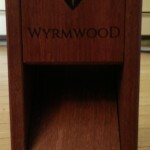 A dice tower, tray, and vault were provided free for review by Wyrmwood Gaming.